I had the opportunity for a little bit of a Q and A Chat with Areva Martin, parent, author and advocate after I had a chance to read her book, The Everyday Advocate: Standing Up For Your Autistic Child! Nationally recognized expert on autism advocacy Areva Martin shares her hard-won knowledge as a parent of an autistic child and an individual rights attorney. In The Everyday Advocate, she lays out vital and relevant step-by-step instructions to parents facing the seemingly impossible odds of advocating for a child with autism. Parents need to become activists for their children's rights to services and learn how to safeguard those rights-both in school and in the larger outside world. An invaluable resource,The Everyday Advocate offers practical, real-world actions that work, lists helpful websites and organizations, and gives parents and caregivers the emotional support they need as they face the challenge of successfully standing up for children with special needs. I have to say that I absolutely love this book - the writing style, the layout and the case studies take some of the stress that you feel as a parent advocate for your child and hone it by giving it more direction and focus! This book, from my point of view, is a must read for parents of a special needs child with Autism once they are past the initial stages of understanding the diagnosis and are ready to be proactive in their child's future! Ms. Martin, Thank you for agreeing to be part of my Autism Awareness month event. After reading your book, The Everyday Advocate: Standing Up For Your Autistic Child , I just wanted to thank you for writing such a supportive and caring book. As a mom who is beginning her advocacy career, I often find that I reflect most on the balance that my son needs - to still be a preschooler and a child, with the research that says that early interventions are so vital, and your book has helped me clarify what I need to do for my son and for my family. 1. What are your top three pieces advice for parents who are new to advocacy? a. Jump right in. Don't be held back by preconceived notions that you need to be a lawyer, politician or someone with experience to do the job. All you need is a passion and purpose. b. Learn to hear NO and not be moved. One of the recurring complaints I hear is that I tried and they said NO. For a lot of people, this is enough to make them want to give up or assume that there are no options. Advocacy is a process that takes many forms and a rugged determination. Go into knowing that you will face obstacles and set backs, but that they are temporary. Giving up is permanent. c. Pace yourself. This is a marathon and not a sprint. Many young mothers set out to conquer the world of advocacy in a month or year. This can't be done. I have been at it for years, and still learn new things everyday. If you set unrealistic expectations and they are not met, you will feel discouraged and are likely to give up or burn out. Your child needs you for a life time, and you must make a sustainable commitment that can endure through the many stages of his growth and development. 2. How far down the road should we be looking and how early should we be advocating for things like high school, college and adult programs? Its never too early to plan ahead. You should be thinking about all of these things at the onset of a child starting school just like you would with your typical child. Most parents start to dream about or at least form an intention that their typical child will go to college at birth. Its not different with your child with autism. Start dreaming and planning now, just know that flexibility is key. You may have to adjust those plans many times, but if you don't set the bar high, no one else will. 3. How do you suggest getting family and friends involved in our advocacy? Lead by example. Advocacy is and can be a family affair. Gather all of your friends and family and get them to attend a workshop with you, sign them up for a local charity walk or have them participate in a play day with your child. All of these are simple ways to help them gain exposure and greater awareness about the disorder and its impact on families. Once they get this basic exposure, enlist them to help out at your child's school, volunteer at a local autism charity or to sponsor a support group meeting themselves. 4. What was your biggest challenge when you were starting out? Finding a reliable and consistent source of information. In many ways, that's why I wrote the book, The Everyday Advocate. I wasn't pleased with the resources that were available, most of which were personal stories or medical books. I couldn't find a step by step comprehensive guide that addressed school issues, advocacy, interventions, work life balance and the other issues that were important to me and to other parents that I met. 5. On a more personal note, if you could invite anyone to a dinner party (living or dead, real or fictional) who would you invite and why? My grandmother, Doveanne and godmother, Ethel. They never got to meet Marty or my two daughters, Michael and Morgan. I think having a better understanding of our history would help shape our collective future. Areva Martin, Esq. has appeared on Dr. Phil, Good Morning America, and FOX News, and has counseled hundreds of parents of autistic children. A graduate of University of Chicago and Harvard Law School, she is the founding and managing partner of Martin & Martin, LLP. Additionally, Martin is the president and co-founder of Special Needs Network, Inc. (SNN), a non-profit launched specifically to support families with special needs children. 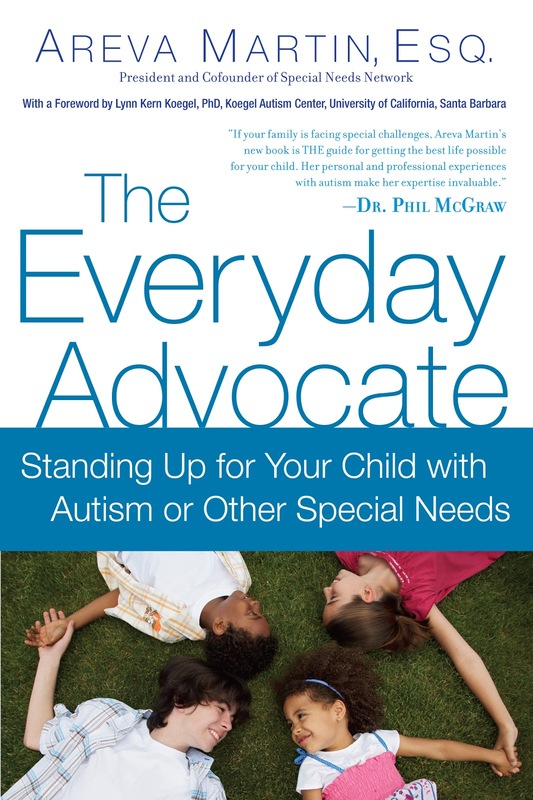 The Giveaway - two lucky winners will each receive a copy of The Everyday Advocate: Standing Up For Your Autistic Child ! "#WIN The Everyday Advocate #Autism Book from @chascouponmom at Acting Balanced http://bit.ly/hgMuL5 #giveaway ends 5/2 "